Wearing this gorgeous pendant necklace is like having summer around your neck. The focal is made of a pair of iridescent white osmina shells bonded together, so that either side presents the viewer with an eye-pleasing curve. The pendant glows in shades of green, aqua, rose and lavender. 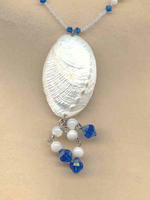 I've added a tassel of mother-of-pearl beads and vintage Swarovski ultramarine ('Capri' blue) crystals. The color combination of the pendant necklace is just naturally nautical. From the pendant's upper loop to the bottom of the longest tassel element measures approximately 3-1/2". 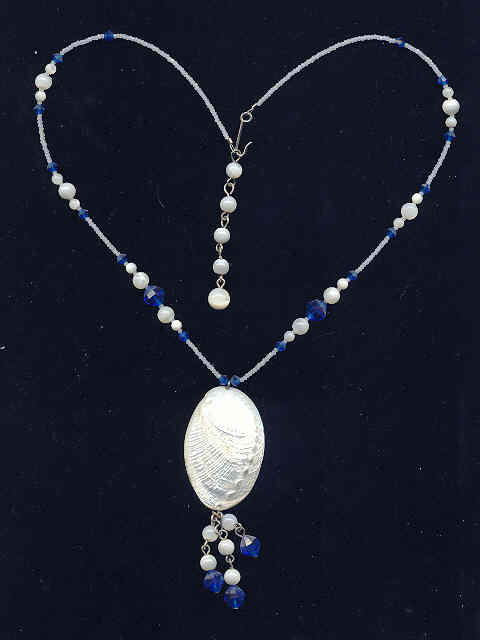 The strand also features mother-of-pearl and Capri blue crystals, and tiny alabaster seed beads. 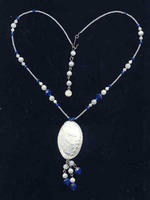 The hook and extender closure gives the pendant necklace a working length of from 18-1/2" to a hair less than 20-1/2". 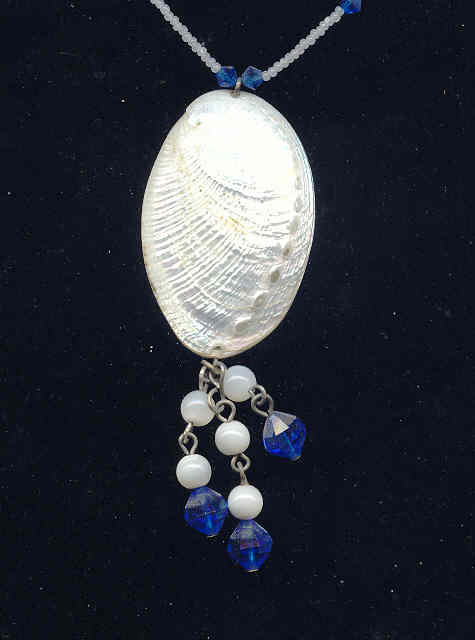 The perfect accessory to wear on a winter cruise -- or to wear when you need to feel as if you ARE on a winter cruise -- this beautiful and beautifully-priced pendant necklace is brought to you by SPARKLE PLENTY. After WWII, Japanese artisans produced some of the most innovative beads and beadwork the world has ever known; this pendant is a fine example.